Here on the island of misfit toys that we call Manhattan, a wonderful, magical bar has popped up in Alphabet City. Cleverly named Miracle on Ninth Street, the bar is an ode to the holidays. It’s decked out in wrapping paper, tinsel, garlands and Christmas lights; there’s even a Hanukkah nook bathed in blue light with silver decorations. The menu, which is printed on Christmas cards, reads like a holiday party on mushrooms. It includes an eggnog made with hay and butter fat-washed Cognac (finally, we know how delicious a manger would taste if it were a cocktail), a tropical hot buttered rum made with pineapple juice and coconut butter and, since not all Christmases are gilded with gold and held in mansions, a Redneck Flip made with bourbon and marshmallow-Budweiser syrup served in a Budweiser can. Here, a look at the over-the-top bar, which sadly is only around until Dec. 23. 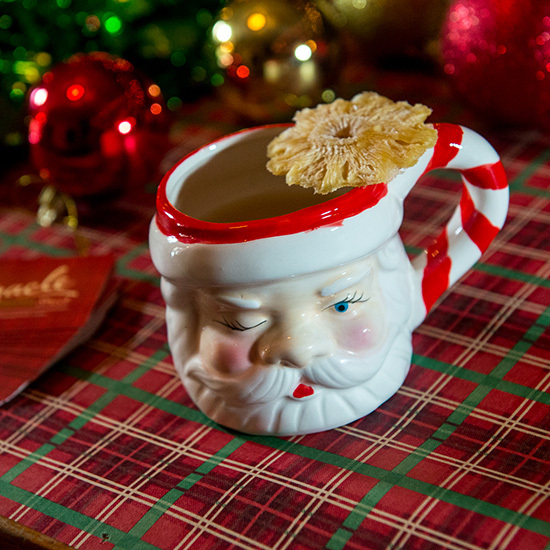 Drinks are served in kitsch mugs shaped like Santa’s face or lower half. Chairs are covered in giant Santa hats, and the ceiling is decorated to make you feel like you are drinking one giant Christmas tree. The Bad Santa cocktail is a fruity, coconutty take on a hot buttered rum made with two types of rum, pineapple juice, milk, lemon juice, coconut water and coconut butter. The Hanukkah alcove is decorated with blue and silver tinsel and ornaments. Served in a cute vintage mug, the Jingle Ball Nog is made with hay and butter fat-washed Cognac, almond milk, cream, spices and egg.